The project concerned the potential acquisition by an international oil company (IOC) of a 50% interest from an international energy company (IEC) of its 50% economic interest in Oil Development Company (ODC), giving it a 25% economic interest in ODC. ODC was a holding company located in a developing country (Figure 1). 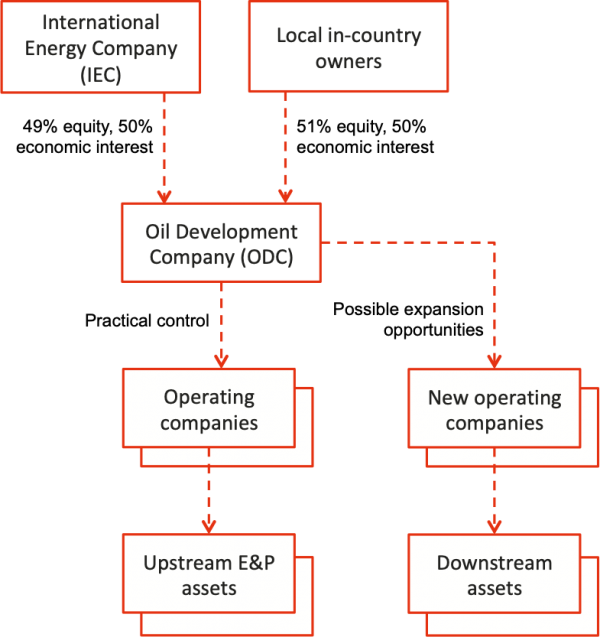 ODC controlled a number of operating companies with upstream oil and gas exploration and production (E&P) assets. ODC was a mid-range company with a forward plan aimed at substantial growth. It planned to increase its oil and gas output from its existing upstream assets. It also planned to become an integrated oil company by acquiring downstream assets, including refineries. IEC wanted to divest part of its equity interest in ODC so it could reduce its exposure to the country and diversify its portfolio of investments. For IOC, the acquisition of a share of IEC’s interest in ODC would provide a strategic foothold in a new and potentially important location. Broadleaf was asked to assist IOC in assessing the opportunities and threats associated with the acquisition, to contribute to IOC’s due diligence, submissions and approvals process. There was a specific objective of generating input for an imminent meeting of the Executive Committee (ExCo). The focus did not include operational opportunities and threats unless they were important for this stage of the process. They would be examined in later, more detailed assessments, but only after the ExCo had given approval to proceed to the next stage. The assessment process followed the IOC’s enterprise risk management framework, which was compatible with ISO 31000. The risk analysis used the company's analysis and evaluation scales, with the financial scales adjusted to reflect IOC’s potential shareholding in the new entity. The context and business environment in which the acquisition would take place were examined in detail. In particular, a comprehensive project framing exercise was conducted as a brainstorming activity with the project team. 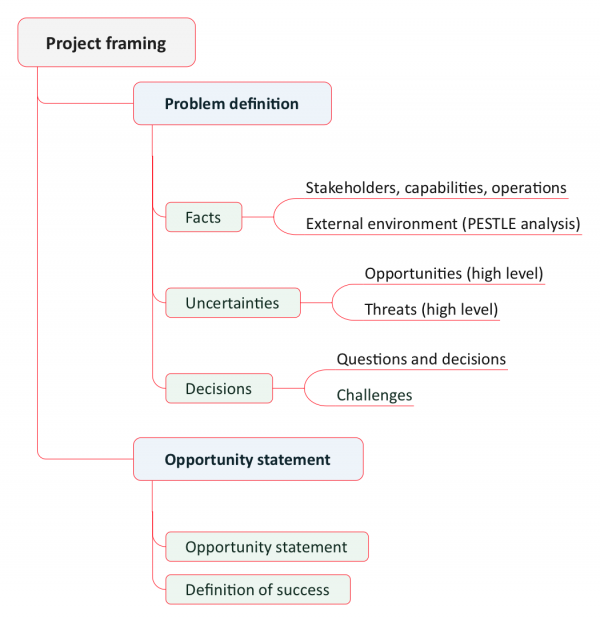 The outcomes from the framing workshop were a structured list of facts, uncertainties and decisions that defined the problem for IOC, a clear opportunity statement and a specification of what success would look like (Figure 2). The key elements in Table 1 provided the basic structure for the brainstorming activities to identify opportunities and threats in the workshop. They were intended as a guide for brainstorming only, not a formal classification of strategic issues. Grouping items into the key element structure in Table 1. This consolidated register was used as the starting point for opportunity and threat identification in the workshop. Risk assessment was undertaken in a facilitated workshop with 20 members of the project team and its external advisors. Collectively, they had expertise in all the key elements in Table 1. Assigned responsibilities for each opportunity and threat. In the second pass, participants reviewed and confirmed the risk rating for each opportunity and threat. The outcomes were reviewed after the workshop and initial management responsibilities were allocated for each opportunity and threat. Some reclassification of opportunities and threats into more appropriate key elements also took place. The main outcome from the assessment workshop was a list of key opportunities and threats for the project, with agreed priorities and responsibilities for avoiding or controlling the threats and capturing and exploiting the opportunities. Some operational opportunities and threats that were not relevant to the ExCo approval decision were removed from the outcomes, but they were recorded and maintained for inclusion in the register for subsequent stages of the project. There were 64 risks (Figure 3), of which eight were opportunities and 52 were threats. Six of the opportunities were related to ODC’s existing business, and two were related to commercial matters. The register showed the opportunities and threats as they were on the day of the workshop, given the effectiveness of the controls at that time. At this early stage of the due diligence process there were few controls in place, although many were planned, and the high numbers of high-priority items reflected the absence of controls. As due diligence progressed, many of the priorities were expected to reduce. There were seven risks with Priority 1 that were fundamental to the approval decision. More generally, this acquisition might restrict IOC’s ability to undertake further major business activities in the country. Failure to capture the growth anticipated from the business. The outcomes were important for the project team, both to inform the submission to the ExCo and to structure the due diligence process. Not many opportunities were identified. It was recognised that the proposed acquisition offered opportunities for the company, but there were many threats associated with it, and with the country where it was located. The focus of participants in the workshop was often on potential fatal flaws for discussion at the ExCo meeting. This is common at very early project stages – there is a concentration on potential deal breakers, because unless they can be addressed and eliminated then other analysis is irrelevant. While this assessment was focussed on generating information for the ExCo, other opportunities and threats were identified during the process. These were not relevant for ExCo at this stage of the project, but they would be relevant for future stages. It is good practice to retain risks that apply to future stages of a project, as inputs to later assessments when those stages are reached. All ideas should be recorded where it makes sense to do so. The initial framing stage generated valuable information in its own right. Its main purpose though was to establish a clear foundation for the risk assessment and ensure that this was efficient and comprehensive. The risk register identified those parts of the acquisition where there was greatest uncertainty, often because the controls had not been examined in much detail. The risk priorities thus set the short-term priorities for the team’s due diligence and control development activities that would reduce uncertainty. We have often used risk assessments to help teams set work priorities as their projects move through approval tollgates (or stage gates) towards final investment decisions. Much of the effort at any of the early stages of a project is devoted to reducing uncertainty to what the company believes is a tolerable level. The risk assessment is an excellent tool for this.